Liverpool's Steven Gerrard has revealed that the imminent anniversary of the Hillsborough disaster was behind his emotional reaction at the end of Sunday's win over Manchester City. 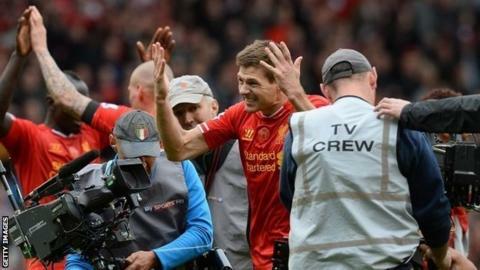 The Reds captain covered his eyes after the 3-2 win at Anfield, hiding tears. "The reason I was so emotional was because of when this game fell," said the 33-year-old. "I'm speaking on behalf of everyone when I say the win was dedicated to the victims and families of Hillsborough." The win over title rivals City, which boosted the Anfield club's chances of a first league crown since 1990, came just two days before the 25th anniversary of the Hillsborough tragedy in which 96 Liverpool fans died. The midfielder's 10-year-old cousin, Jon-Paul Gilhooley, was the youngest of those who lost their lives at the FA Cup semi-final with Nottingham Forest at Sheffield Wednesday's Hillsborough ground on 15 April, 1989. Gerrard and his team-mates will be among 24,000 people at the annual memorial service, which is scheduled to start at 14:45 BST at Anfield on Tuesday. There will be a one-minute silence at 15:06 - the exact time the game at Hillsborough was abandoned - during which bells will be rung 96 times across Merseyside. "[My reaction] wasn't just because it was a big match in our season, it was because this week is always about more than football for everyone associated with Liverpool," he said. "All the squad will be present at the service to pay our respects as we should." Current Reds boss Brendan Rodgers will give a reading at the service, as will Everton counterpart Roberto Martinez. The number '96' will be written on the pitch in large figures made up of scarves donated by fans of all clubs after Kenny Dalglish - manager at the time of the disaster - wrote to all 92 League clubs as well as the English, Northern Irish, Scottish and Welsh national teams asking for support. The idea was inspired by the 'mile of scarves' formed between Anfield and Goodison Park a week after the disaster.